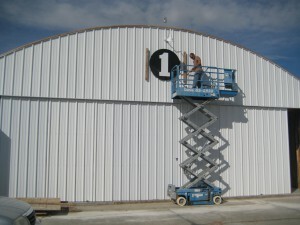 Carrera Hangars is a company dedicated to providing superior accomodation for light aircraft. It’s not our sideline, it’s our only business and we are committed to giving the people involved in recreational aviation not only what they need, but what they want. The configuration of our standard hangar is 40 feet wide, 32 feet deep and 12 feet high with a 20 foot tail section. Each hangar building of twenty T hangars also has several larger units that could accommodate a twin-engine or small jet. All of our hangars have concrete floors with vapor barriers, multi panel rolling steel doors, ample electrical power, and compressed air lines. We are involved in recreational aviation too and understand your desire to customize your hangar by adding an office, a loft, built in storage racking etc. Let’s talk.